The DExEU and the Northern Ireland select committees are the only ones in which the Conservatives and the Democratic Unionist Party (DUP) together have a majority. However, they have rarely been able to take advantage of this, because the DExEU committee is not divided primarily along party lines. Most divisions have seen Leave-supporting MPs oppose those who supported Remain, indicating a Leave versus Remain fault-line. However, this terminology is problematic, as four of the five Labour members voted to trigger Article 50, and the committee does not suggest halting Brexit. The divide is better described as one between those favouring a harder Brexit and those favouring a softer Brexit. The level of division in the committee as a whole can be seen by assessing the 41 votes taken on the first four reports of the 2017-19 session using the Rice Index. The index varies between zero, when the committee is split 50:50, and 100 where all members vote the same way. As there are only 21 committee members, the index is rather sensitive to small changes in the numbers voting yes or no. Nevertheless, it gives us a broad indication of the level of division. The average Rice Index value for the committee as a whole, on votes on reports, is only 23. 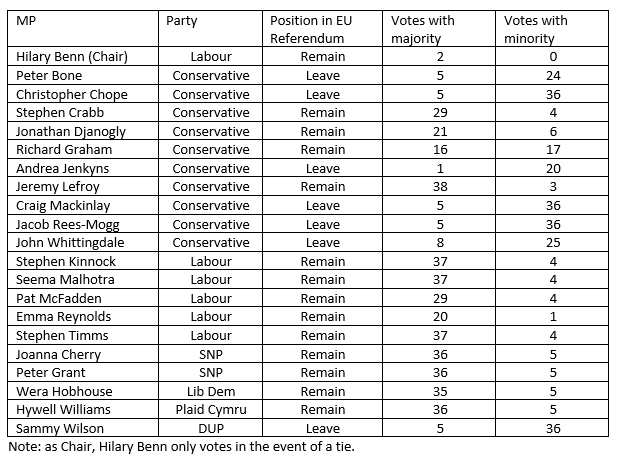 Looking at the Rice Index by party and by referendum position, we see that MPs who voted Leave score 100 on the index for 38 of the 41 divisions. Those voting Remain have an average Rice Index value of 80. Labour MPs voted entirely cohesively on all votes, while Conservatives were much more divided with a Rice Index average of 48. 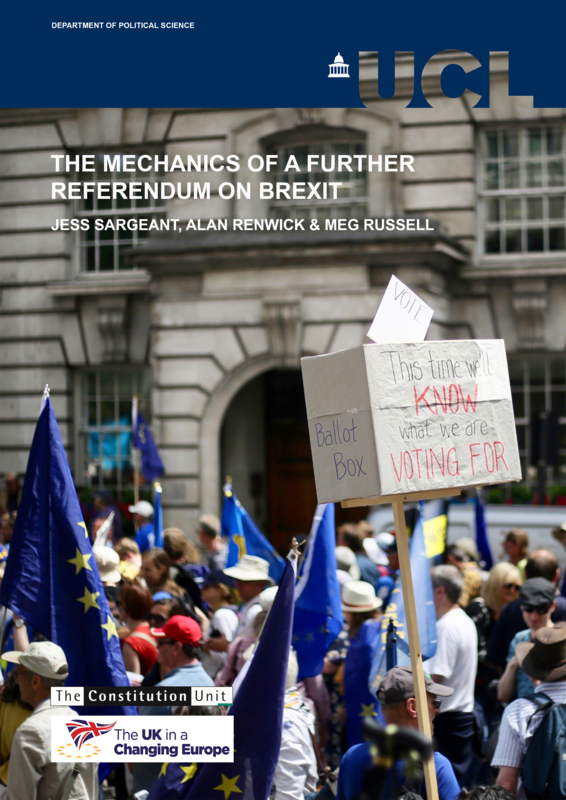 Jeremy Lefroy and Jonathan Djanogly – rebels on the Grieve amendment to the European Union (Withdrawal) Bill – are most likely to side with the majority, but Remain voter Richard Graham has often voted with the eurosceptics. While they tend to vote cohesively, hard Brexiters have been in the majority on divisions on reports only five times (see Table 1). Our analysis showed that an MP’s position in the referendum has by far the largest effect on whether they vote in a hard or soft Brexit direction on the committee. Devolution is another fault line. The highest value for the Rice Index for the whole committee in votes on reports is 58, for a division in the third report of 2017-19 where the committee was split along union versus devolution lines. In the 2016-17 session, five of the 11 divisions across three reports saw a union-devolution divide. Only seven of the 86 House of Commons departmental select committee reports published so far this session have seen divisions, but all have been on Brexit-related issues. With another 25 such inquiries underway, further divisions are likely. But no other committee has such a stark divide between Leave and Remain members as the DExEU committee. Achieving consensus on the DExEU committee is a tall order given its size, status as lead committee on such a contentious issue, and the entrenched positions of some members. Efforts have been made to reach agreement and have borne fruit on some issues. But relations between eurosceptics and chair Hilary Benn have been strained in this and the previous session. Benn recognises that divisions will occur, and the reports have produced bold recommendations. Too great an emphasis on achieving unanimity may mean committees avoid inquiries on controversial topics or settle for anodyne reports. Conservative eurosceptic members, who are all members of the European Research Group, have challenged the Remain/soft Brexit position and opposed each report. 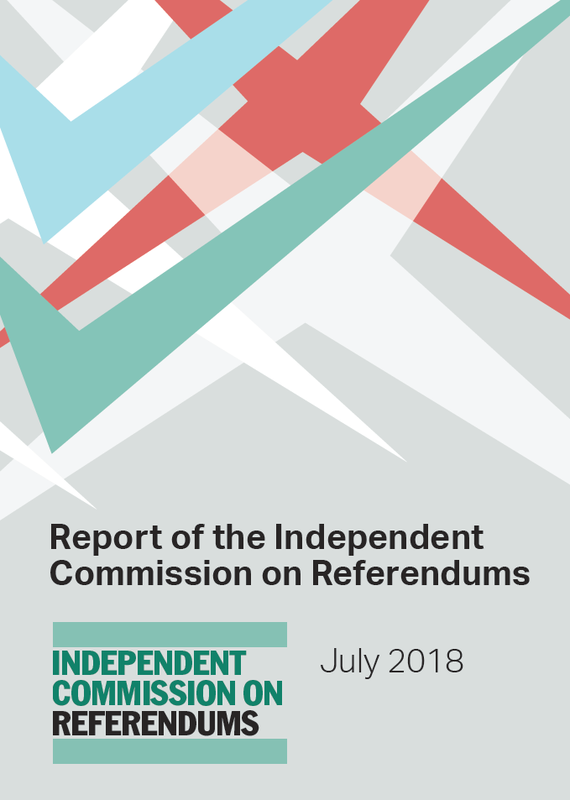 In the third report of 2017-19, the seven Leave-supporting members backed an alternative draft report which struck a more optimistic tone on the Irish border and a free trade agreement. This was one of 18 unsuccessful amendments to reports tabled by Leave supporters. They also opposed the recommendation in the third report that the Article 50 period be extended if agreement on the Future Partnership is not reached (paragraph 86), the 15 tests for the Future Partnership set out in the fourth report (paragraph 181), and its suggestion that EFTA/EEA membership has advantages should negotiations fail (paragraph 114). Divisions may be damaging, but it does not necessarily follow that the committee is ineffective. 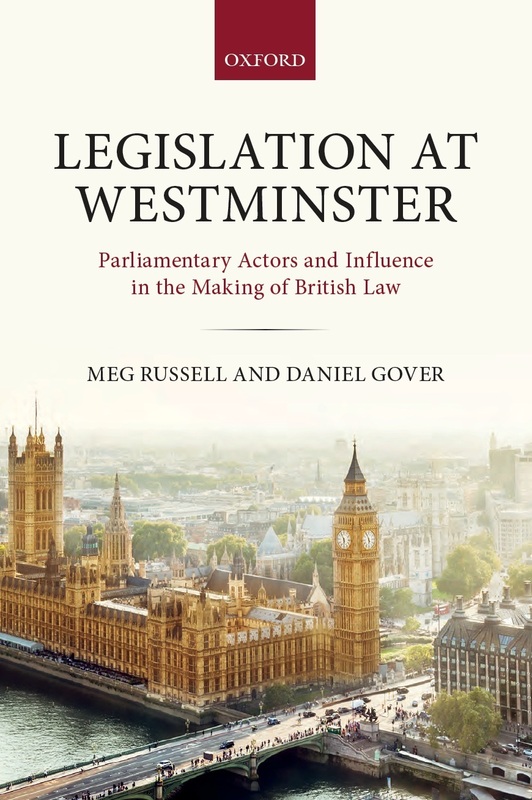 Previous research on select committee influence by Meg Russell of the UCL Constitution Unit shows how it varies from government implementation of committee recommendations, to drawing attention to issues, acting as a source of evidence, and holding ministers to account. In 2016-17, DExEU committee recommendations on a transition period, a parliamentary vote on the final deal, and publication of a White Paper on the government’s approach to negotiations helped to set the agenda and change the government’s position. Ministers have faced challenging questions from committee members. A comment by David Davis on a ‘meaningful vote’ prompted an urgent question in the Commons. The committee also published the government’s sectoral analyses and economic analysis following Labour’s humble addresses. Most Conservative Eurosceptic members voted against their publication. The scale of Brexit-related work across select committees allows many issues to be covered, but there are questions about coordination. Common themes are emerging, such as opposition to ‘no deal’ and support for continued regulatory alignment and close links with key EU agencies, making it more difficult for the government to dismiss them. Philip Lynch is Associate Professor of Politics at the University of Leicester. Richard Whitaker is Associate Professor of European Politics at the University of Leicester. 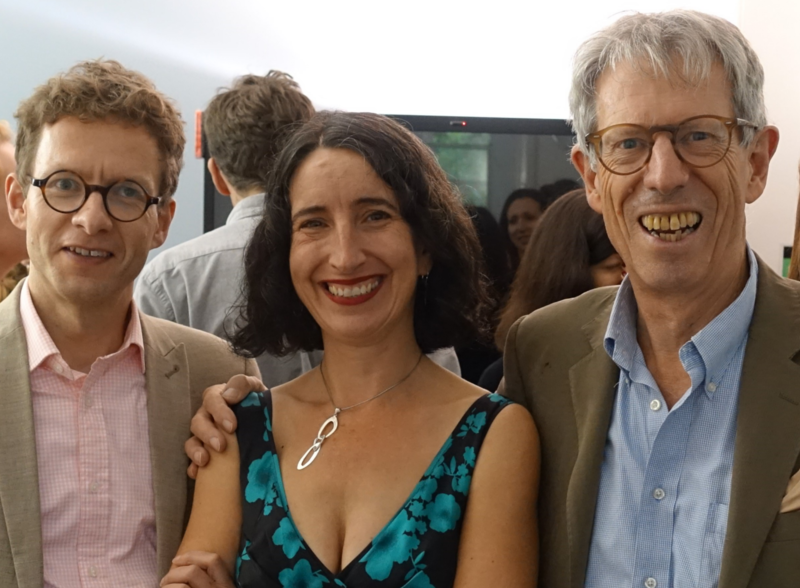 They are co-investigators on the UK in a Changing Europe project ‘Parties, Parliament and the Brexit Process’. 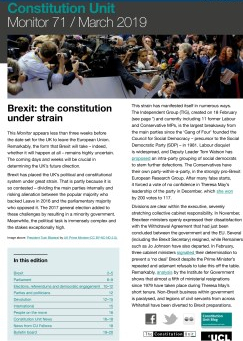 This entry was posted in Europe, Parliament and tagged Andrea Jenkyns, Article 50, Brexit, Christopher Chope, Craig Mackinlay, Department for Exiting the European Union, DEXEU, Emma Reynolds, European Research Group, Exiting the European Union Committee, Hilary Benn, House of Commons, Hywell Williams, Jacob Rees-Mogg, Jeremy Lefroy, Joanna Cherry, John Whittingdale, Jonathan Djangoly, leave, meaningful vote, Pat McFadden, Peter Bone, Peter Grant, Philip Lynch, remain, Rice Index, Richard Graham, Richard Whitaker, Sammy Wilson, Seema Malhotra, Select Comittees, Selective Influence: The Policy Impact of Select Committee Reports, Stephen Crabb, Stephen Kinnock, Stephen Timms, Wera Hobhouse. Bookmark the permalink.